The first thing you want to do when writing your resume from scratch is to create an inventory of everything you have done in your career. This could be work experience, places you’ve worked, college, education, research, skills, accomplishments, references, training, seminars, published works, inventions, association memberships, honors, awards, volunteerism, etc., even personal hobbies. Anything and everything. Use this resume planning worksheet as a guide to help you collect and inventory of all your skills and experiences. Avoid looking at a resume template you found on the Internet and trying to cobble all of your life’s experiences to fit. The best way to write your resume is to take your time and write down everything I mentioned above and organize it into a resume worksheet. This way you’ll have everything all in one place and then you can systematically read through this article while transforming your worksheet into a first class resume. And I’ll be here with you every step of the way. I created a simple resume writing worksheet you can download that will help you to create an inventory of your skills, accomplishments, work experience, education and volunteerism. This is probably the easiest part of writing your resume. It’s as simple as putting your name at the top of a piece of paper. But don’t worry because I’m going to show you how to do it with a little bit of style so you look professional. Optionally, you can put credentials next to your name. That’s it. Nothing more is needed nor expected. I’m going to show you two very common and accepted resume heading examples all you need to do is pick the one you like the best. Start with the resume writing worksheet I mentioned and create your heading using your personal contact information. This format is the most common way to write your resume heading is centered at the top with your name in a 16pt Bold Arial font with your contact information in a 10pt Arial. Option 2: More efficient. Just as effective as option 1, but takes up less space, and my personal favorite. A job objective is a statement that clearly defines the type of job you are seeking in a particular industry. There is much controversy on whether you should use a job objective statement or not. It’s seems 50-50 between experts. Those who agree and those who feel it’s outdated (for some reason). I’m a big proponent of having a job objective statement on your resume. Without it, you are making it difficult for employers to qualify you in an efficient manner. For example, if I’m a Project Manager looking for a position with a hi-tech company, wouldn’t it be better if I clearly communicated this on my resume? And if I were a hi-tech employer who was looking to hire a Project Manager, and I saw a job objective on a resume that said, “Seeking a position as a Project Manager…” Don’t you think that might grab my attention? It’s no different than if you were going out to dinner and wanted to eat seafood. If you only saw restaurants with signs that said “Restaurant or Food.” Would you stop? NO. But if you saw John’s Crab Shack, you might stop in. Do you see where I’m going here…? A job objective statement on your resume does the same thing. The best place to put your job objective is under your resume heading. This way, anyone who reads your resume will immediately see your name, and then your objective, thus instantly communicating to the reader the type of job you are seeking. Write your job objective as concisely as possible for maximum effectiveness, 5 words is best, but try to limit yourself at 10 words. You’ll have a more powerful and effective objective by keeping it short. Now, create a simple statement that sums up your answers to the Job Objective qualifying questions. Let me show you the wrong way first, to OR at least what I think is a WEAK way to write your objective and then I’ll show you a better way. This statement sounds like everyone else. Of course you want to be challenged and utilize your skills. But you need to be specific with what you want so you can stand out from everyone else. The strength in this objective comes from it’s simplicity. Let’s look at another example of a weak resume objective and then we’ll transform it into a stronger objective. It’s weak because “results oriented” is used by every other job hunter on the planet and does not carry the same weight it once did. Now it’s your turn. Use the resume writing worksheet you filled out and begin creating your job objective. Don’t expect to get a perfect objective the first time around. The more you write and play around with it, the better it will get. Not only does your Job Objective statement tell a potential employer what you are looking for, it also helps you focus your thoughts on creating a targeted resume. If you don’t know what kind of job you are looking for, how do you expect to find it? Writing your objective is one of the most important steps you need to do before writing your resume. Even if you prefer to leave it off your resume, it’s still an essential exercise to complete. Your Job Objective statement is going to tell a potential employer exactly what kind of position you are looking for. Many job seekers are often anxious to begin searching for a new job and make the mistake of creating a catch-all resume that makes them look like a jack of all trades. They end up being too vague on their resume about the type of position they want because they want to be considered for everything. My advice: Make the employers job simple and give them a resume that is matched exactly to the type of person they are looking for. Remember, the key here is to say as much as possible about the job type you are looking for in as few words as possible. Though it is best not to use exact job titles as your objective because some job titles could have different meanings in different industries, but there are also times where the exact job title is perfect for your job objective. It just depends on your particular circumstances. This section is usually a bullet point list of 5-7 of your best skills written as accomplishments. You don’t want to list every skill or accomplishment you have, just the ones that carry the most weight and are relevant to the job you are applying to. Most importantly, you want to demonstrate the skill in a qualifications statement to emphasize how you’ve used it, where you used it, and what you have done with it. If you simply list raw skills by name, e.g., Microsoft Office, WEB Programming, leadership experience, etc. then you’re selling yourself short. The real value comes from putting your skill(s) in context. You want to use your skill in a statement that describes what you’ve done with it and that will validate that you really know what you’re talking about. Anyone can list a myriad of skills on their resume, but the very nature of listing skills out of context instantly devalues them. Which Skills Statement do you think is more powerful? Candidate two: Led a technical team of 17 web developers to design a customer database application that tracked buying trends for customers and resulted in a 13.7% increase in year end sales. Which candidate do you think has more leadership experience? If you said Candidate two, then you’re right on track because he demonstrated his leadership experience, where as Candidate 1 only said he had leadership experience. But all too often, most job candidates sell themselves short on their resume by listing raw skills instead of putting them in context. 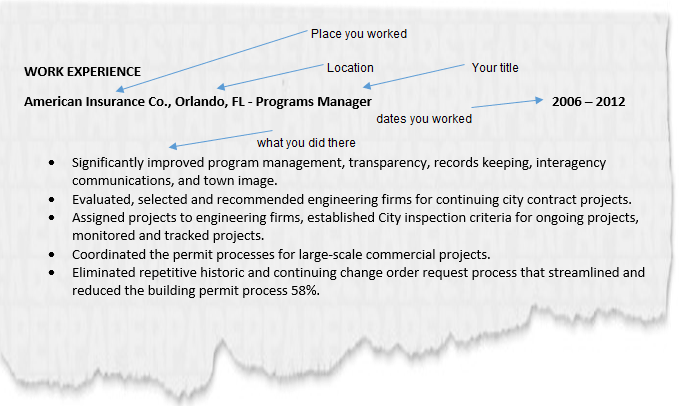 Your skills statements should make it easy for an employer to visualize you working for them. After an interviewer reads them, there should be little doubt in their mind that you are perfectly qualified for this job. I have seen many very poorly written Skills Summary sections. Some people feel the need to list every skill they have learned, some with 30 – 40 skills. In cases like this, they are trying to be all things to all people, which you can’t do. Your skills section needs to be tightly focused on the type of job you are seeking and more importantly, it needs to match and be consistent with everything else on your resume. Exceptional problem solving skills, etc. These phrases sound good and seem to pack a punch, but when you get right down to it, they are vague and boring. They are overused by every other job seeker on the planet and they simply don’t carry any weight, not to mention being extremely nebulous and indefinable. You need to be powerful and specific. Remember, the key to writing a powerful Qualifications, Accomplishment, or Skills Summary statement is to pack it full of quantifiable accomplishments from your past so it grabs the employers attention and makes them want to keep reading your resume. 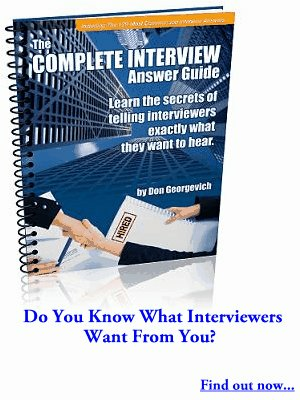 In this section, I’ll show you how to write your Work History section in a way that will impress employers so they will call you for an interview. Your resume should generally be no more than one page long, but if you have lengthy career history, you can easily use two pages, but be sure to stop at two. Resumes that exceed two pages are better suited for academic and scientific positions. Your work history is probably the most critical section of your resume. It’s where you get to show-off your skills, strengths and accomplishments in much greater detail than you did in your Skills Summary. Your work history section will instantly signal your previous track record or past performance to a potential employer. It will highlight your skills, talents, show how long you’ve been working, or how long you’ve been out of work. It will show an employer what you’re best at doing. Under each job, write down everything you did, no matter how small or insignificant the skill or task; write it down. Write down your accomplishments, contributions, recognition awards, achievement awards, and job responsibilities. If you completed the resume worksheet exercise you should already have this list. Don’t expect to complete this step in your first attempt. As you continue to work through this section and review your past job responsibilities, you’ll keep remembering more and more about the things you did at your past jobs. We’ll soon turn those into powerful achievement statements. The key to writing your work history that makes you look like a star begins here. Employers don’t care about your past daily duties, what your job description was or how many skills you possess. They mainly want to know what you accomplished at your last job. It’s very important that you learn how to recognize your own accomplishments. An accomplishment is not a task, a duty, or a skill, but something you did that helped your employer and has measurable results. Now that you have created a list of all your past skills, accomplishments, contributions, recognition awards, achievement awards, and job responsibilities, it’s time to transform these into powerful action statements that highlight and emphasize the results you created or generated for your past employers. Use the AR to turn your work experience into accomplishment statements. What ACTION did you take to solve a problem? How did the company benefit from the results of your actions? Use this simple formula to create all your achievement statements. For example, let’s say you worked for an insurance company and were responsible reducing claims management. Start your accomplishment with a good action verb, like REDUCED. Then tell them specifically what you reduced. Not just claims, but customer claims. End with how you I did it. By improving management accountability. If you can’t make fit what you want to say into this formula, then you are probably not writing an achievement statement, but a job description. It is best to minimize the amount of job descriptions on your resume because they carry very little weight with employers. Increased line capacity 29% by leading a cross-functional team to improve the manufacturing of telescopic hydraulic cylinders. Developed and implemented cost controls which were tested by Deloitte and placed us in compliance with Sarbanes-Oxley requirements. Managed and monitored service delivery for multiple on-line, web-based, learning industry products, resulting in $2.5M in sales over a 10 month period. Created and streamlined project documentation, resulting in a 33% reduction in end user training. Provided Microsoft SQL deployment strategies to Exxon Mobil that aided in decreasing the typical deployment time 54% of their new CRM software. Managed a six-person sales team that increased software sales from $11million to $43million over a 14 month period. On average, you should have about 6-10 work experience statements for your most recent job. For subsequent job’s you’ve held previously, 4-7 statements is appropriate. These are just guidelines, but ultimately, whatever number of statements you NEED is the right number. And I said NEED. I urge you to avoid putting down statements that demonstrate skills that are not relevant to the job for which you are applying. You want your resume to be relevant to the job description. After all, if you write your resume based on the job you have, you’ll end up getting the same job. But if you write your resume for the job you want, then you’ll have a much better chance of getting something new. In this section, I will show you how, by example, to write a powerful Education section. I’ll show you proper placement for your degrees, grade point averages, volunteerism, training and certifications. Even if you don’t have a college degree, I’ll show you some great ways to creating a powerful Education section. To see more examples of work experience statements, you can download my resume swipe file. Start your Education section under your completed Work History section. Make a list of all your training and education that’s relevant to your job objective. This could be your internships, workshops, certification courses, volunteerism, research you’ve done, publishing’s, affiliations, awards you have received, etc. 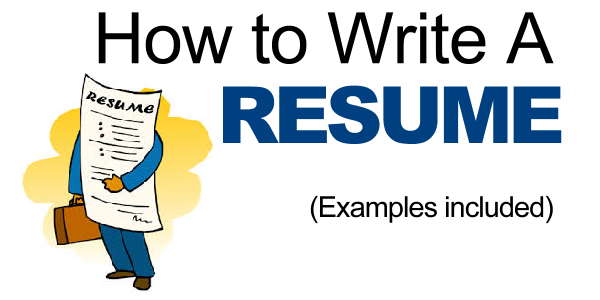 If you’ve been following along with your resume writing worksheet, then you already have this. Your education section is traditionally listed near the bottom of your resume. But it doesn’t have to be. There are a few cases where it would be to your advantage to place it near the top of your resume, under your Skills Summary. You lack work experience in your field and your education is the only experience you have that is related to your job objective. Your education is directly tied or even required for the job for which you are applying. You have performed and presented extensive research that is highly relevant to your job objective. Start off by listing your most recent degree, first. You don’t have to list every school or college you attended, just the one’s where you received your degree or are currently pursuing your degree. If you have only partial college coursework and no degree, then list the number of years you have completed towards a degree. See examples later in this section. Attendance or graduation dates are optional. Omitting them makes it more difficult for an employer to determine your age. The age you would like to project to employers is up to you. It is not recommended that you show your high school or prep school if you have a college degree. Even if you don’t have a college degree, but have completed some college coursework, it would still be more beneficial to show an incomplete college degree than showing your high school education. As you’ll see in the education examples below, some will have dates, some won’t. Some will emphasize class ranking and GPA and some won’t. Some will show graduation and others won’t. There is no one right way to list your education. Just gather the facts about your education and choose a format that pleases you. If you are worried about age discrimination, then consider leaving off your graduation dates. Optionally, you can bullet point your educational achievements. Remember, when listing all of your professional associations, achievements, training and certifications – list only the ones that are relevant to your job objective. When listing your degree, say for example, a Bachelor of Arts. It is completely acceptable to either write BA, B.A, or spell out Bachelor of Arts. Understand the market for your skills and avoid appearing over-qualified. Consider listing all non-college education, such as, training, certifications, achievements, etc., directly under your education section instead of creating a new section. Doing so will save valuable space on your resume, because adding another section title may take up unnecessary space. What to do if You Have No College Degree? Experience speaks louder than education. I’ve seen many job seekers without college degrees who are making $100,000 or more per year and have a high school diploma as their only formal education. Not having a college education can inhibit you from moving up the corporate ladder in a large organization. But smaller companies are generally not as concerned with a college education and often times, prefer experience over education and employees who deliver results. But don’t get me wrong, a college degree can give you a huge competitive advantage in your career. If you are a seasoned veteran in your profession and you never went to college, I would still suggest omitting your high school education and listing other types of training you’ve had that support your career like, attending seminars or obtaining certifications. I strongly suggest listing something under your Education section. Even though you did not graduate, list the colleges you’ve attended. If you did not attend any colleges then list professional associations, achievements, professional training and certifications. If you are not enrolled in college nor have you previously taken any college classes, you may consider renaming your education section to something like, Professional Training, or Professional Development. Under this section, list any job related training you have received or workshops you have attended as long as it’s related to your job objective. Creating a volunteer section under your education is a perfect place to list volunteer work or community service you have done that might influence a potential employer and further demonstrate your dedication and qualifications. Be careful not to list all of your volunteer work and try to keep it relevant to your job. For example, if you’re seeking a management position, and you volunteered to help manage and coordinate your local schools’ PTO, that would be worth mentioning because you’re a manager, professionally, as well as a volunteer manager. If you have no college or training to list under your Education section, consider listing the volunteer work that you have done. Listing your volunteer work is a great way to fill-out your Education section when you don’t have anything else to use. Do Not Put: References available upon request on your resume. Employers assume you already have references and they will ask you for them when the time is right, after they have decided to hire you. Think about it this way, what if you went shopping for a new car and before you even made up your mind on the kind of car you want, the salesman handed you a list of satisfied customers who bought this car. At this point, you don’t care about those testimonials because you’re not even sure you want this car. Offering references is saying the same thing. Employers may ask you for references once they have decided to hire you. I would not offer my references at any time during the interview process unless an employer asks for them. Most jobs I’ve been hired for were from employers who never even checked my references. To write your references, put your name at the top of the page and write, for example, Professional References for Don Georgevich. Center the text, bold it, and up the font size to a 12-16 point. Then list the names and contact information for 3 – 4 people you know will give you an outstanding reference. All you need is their name and contact information. Title, location, company are optional as far as I’m concerned. You should contact each of these people and ask them for permission to use them as a reference and their preferred method of contact. Your references should be people you have worked with, for example, co-workers, managers, customers, vendors, etc. Do not use family and friends, though I used a friend on my reference sheet because I did business with him. I only ever had 4 references my entire career. Once I found 4 people I knew I could trust to always say good things about me, I never changed my references and they were from many jobs past. You don’t need to have references from every job you’ve had. Now go write your reference sheet and don’t give it to an employer unless they ask for it. Here’s a few last tips to help you write a perfect resume that will get employers salivating over you. Read the job description before you send in your resume. Use the job description requirements as a checklist to compare against your resume. Do your best to make sure your resume is a near perfect match for what they are looking for. Don’t copy the exact wording from the job advertisement, but just make sure you’re a good match for it. Look like a solution to their problems. A job description is nothing more than a list of “problems” a company has, and they need somebody to take care of them. By showing them you’re an expert at solving problems like theirs; you’re relating to their needs, speaking their language, and more likely to get an interview. Use action words to describe your roles and accomplishments. Use key terms that will pop out at employers, usually ones that signify leadership and team roles you’ve had. These include words such as: team work, team player, multi-tasking, executed, organized, performed, maintained, supervised, managed, directed, developed, implemented, etc. Keep your resume tightly focused to the job you are seeking. If you can perform several different types of jobs, then you might consider having a separate resume for each job. Having a resume that bills you as a jack of all trades may sound great, but employers are looking for people who specialize in one thing. For example, you might have one resume that highlights you as a Pre-Sales Engineer, another as a Technical Engineer, and third as a Sales Engineer. This way, when you apply for an engineering position, you have a resume that is tightly focused on your engineering skills. Or if a Sales position comes your way, you have another resume that puts your sales skills in the foreground. Scan test. Many employers can scan your resume in under 10 seconds. Make sure you have a clear job objective. If your resume is not tightly focused on the job you are seeking, nor easy to read, then it might not get read. Employers can quickly figure out if they want to keep reading. Use industry related keywords. Your sentences must contain the buzzwords of your industry to get noticed. Keywords are the nouns or short phrases that describe the essential knowledge, abilities and skills required to do your job that might be used to find your qualifications in a keyword search of a resume database. Inventory your accomplishments. Now, go back to each job and think about what you might have done above and beyond the call of duty. Did you exceed sales quotas by 150% each month? Did you save the company $10,000 by developing a new procedure? Write down any accomplishments that show potential employers what you have done in the past, which translates into what you might be able to do for them in the future. Quantify your accomplishments whenever possible. Numbers are always impressive. Make appropriate deletions. Carefully review your resume and think about which items are relevant to your target job and cross off training and experience that don’t relate to your target job. For example, if you’re an Electrical Engineer, but flipped hamburgers 20 years ago, you can safely assume that the burger experience is not contributing to your candidacy. Remember, your resume is just a way to entice an employer, so you can get your foot in the door. It isn’t intended to be all-inclusive. You can choose to go back as far as your jobs relate to your present objective. Be careful not to delete sentences that contain the keywords you identified earlier. Write clear, compelling sentences. Combine related items to avoid short, choppy phrases. Structure the sentences so they’re interesting to read. Rearrange. List your most important accomplishments first. If you require more detailed help in writing your resume, I encourage you to have a look at the Resume Masterpiece. Now go out there and write the best resume you can and I guarantee you’ll get flocks of employers calling you for job interviews every day. Thank you so much for this Don i really appreciated what you did. Don can you please help me, I need a structure on how to write a professional curriculum vitae, I am 39 years of age, I never be at work before but I want to apply for the professional social work degree as the one of the degree I have, also u want to know how to add working experience. I would like to thank you for providing professional advise on how to write a good resume. I appreciate all what you did to support me. I’m impressed with your lessons on how to do a perfect resume. I will try using your format to do mine. Thank you so much sir. I am impressed by your lesson on how to write the best resume, i will take time to modify my resume according to your teaching. i am grateful to you for hospitality you showed. Thank you very much Don for this outstanding support ,the best money can buy really . Thank you so much! Useful toolkit! 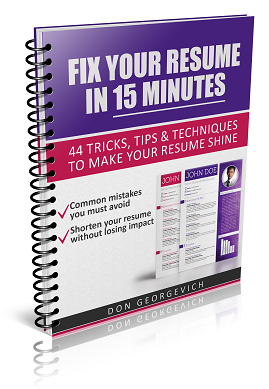 FIX Your Resume in 15 Minutes! 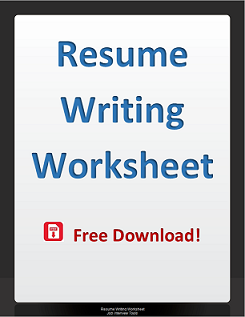 Free Resume Worksheet - Download Now!